OXFORD, Ohio – Miami fans have been through the early-season Ohio State litmus test before. Beat up on the woeful Buckeyes, inspire the team and fanbase with hope only to see that gauge prove wrong once the RedHawks face stiffer conference competition later in the season. But Saturday was different. Miami didn’t beat the Buckeyes, tying them 1-1 at Cady Arena in their home opener, and yet this game gave those in attendance a better understanding of where the RedHawks are than most previous meetings with OSU with a freshman-laden team. The reason is: Ohio State is a lot better than it has been in recent seasons. Entering play at 1-0-1 including a win at then-No. 3 Denver, this edition of the Buckeyes has speed and can move the puck. These essential attributes were severely lacking as recently as last October. This was an entertaining game to watch, more from a purist fan perspective than a casual fan one, as these teams did those unsexy things like backcheck, get sticks in lanes and shut down shooting lanes. But there was still plenty of fast-paced, end-to-end action that is sometimes lacking in October contests as teams are still trying to build chemistry. Miami started sluggishly, with a bad turnover at its own blue line by sophomore Kiefer Sherwood ultimately ending up in his own net five minutes in. The team looked nervous on its home ice. The RedHawks were much improved in the second and third periods, although OSU owned overtime. No one knew what this team would look like when it actually hit the ice this month: Not the fans, media, coaches or even the players themselves. Now after three games we all have a better idea. There is certainly plenty of room for improvement for Miami, but if Saturday is any indication – and this game vs. Ohio State is a much better barometer than those Buckeyes matchups in the past – there is cause for optimism among those who root for this team. Miami forward Karch Bachman (photo by Cathy Lachmann/BoB). – First, it’s really hard to evaluate nine freshman in a 65-minute game when you haven’t seen seven of them play before. The overall impression was that one skater really stood out: Karch Bachman. Bachman, who is a Florida Panthers draftee, has excellent speed and a nose for the net. He was placed on Sherwood’s line, and the two worked exceptionally well together, with Sherwood lobbing outlet passes to him and Bachman using his speed to track them down. It should be a lot of fun watching these two develop together if they remain linemates. Gordie Green and Carson Meyer also impressed among the new forwards. Green is small but seems to do everything, from playmaking to puckhandling to defending. Meyer appears poised to make his mark in the scoring column, as he displayed his missile of a shot a couple of times. He scored 32 times in his first full season in the USHL in 2015-16. Miami used three freshman on defense, and none were terribly noticeable, but that’s meant as a compliment because blueliners often have their names called after making mistakes. And we can’t forget to mention Ryan Larkin. His Cady Arena debut was quite impressive, with his rebound shot save in overtime and breakaway stop in the third period. Coach Enrico Blasi has started the season by giving the backups a start in the first couple of games most years, and it speaks to what Blasi thinks of Larkin that the netminder has been the lone goalie in net for the RedHawks through three games. – It truly is a game of inches. Sherwood hit a crossbar and Bachman rang one off the post, both on excellent scoring chances. If those two remain together they’re going to be a force on this team. – Talk about a game of highs and lows for new captain and junior defenseman Louie Belpedio. Belpedio looked flat-out lost on the ice in the first period, committing multiple egregious turnovers and handling the puck poorly early. But his second-period laser from the high slot resulted in MU’s only goal, and he appeared to settle down dramatically after the first 20 minutes. It was his first game as team captain on home ice, and that role has hindered the past two Miami players to wear the ‘C’ early in the season. – [rant] For the love of God, can we please not have 3-on-3 and skills contests when they mean nothing? They’re passable at best during conference play, but Saturday they served no purpose other than to confuse fans and unnecessarily have players risk injury and/or suspension. So after five minutes of 5-on-5 overtime, the game was officially a tie. Miami and Ohio State are no longer in the same conference, so shake hands and call it a night, right? Nope. The teams skated three a side for five minutes – perhaps for fun? – and then participated in an abbreviated shootout, which supposedly the Buckeyes won. The purpose is clear: College hockey wants winners and losers in each game, and the NCAA is slowly working toward that goal or at least is evaluating its current system. We get that. But the major problem is that fans who don’t live and breathe with their teams don’t have a clue what’s going on. For decades hockey has been all about trying to grow the game, which is really tough with such nuanced rules. Why confuse your fans about the most important aspect of the game: The decision? One knowledgeable fan asked me after the 5-on-5 if the game was officially over for NCAA purposes. I said I thought so but wasn’t 100 percent sure. Another fan asked that fan, who said that was just what he asked me. One fan walked out during the 3-on-3, telling the ushers there was no point in watching since it meant nothing. Ninety-plus percent of the crowd either didn’t get that or didn’t care, wanting to watch the 3-on-3. And make no mistake, the 3-on-3 isn’t the issue, it’s that it meant nothing and the fact that’s a tough message to get out to the masses. To Miami’s credit, it was made clear over the PA. Either have college hockey’s governing body sanction 3-on-3 and shootouts or don’t. The sport and those who love to watch it deserve better than we’re-going-to-determine-a-winner-one-way-or-another-and-oops-Ohio-State-won-nope-just-kidding. We’ve said it before: The NHL is certainly not a model of rules excellence, but it has it right with 4-on-4 overtimes. If that doesn’t determine a winner, it wasn’t meant to be. Or go to 3-on-3 after that. Those two sessions would determine winners 80 percent of the time. But two things: 1) Unlike last night, let’s be consistent and up front about the format from year to year and get rid of meaningless demonstrations to determine a “winner”, and 2) if we’re going to play 10 minutes of extra hockey when the temperature reaches the mid-80s in southern Ohio, can we please scrape the ice first? – Speaking of fans, they were great. The students were on mid-term break, but it was still a loud crowd. Let’s hope that continues, and based on Miami’s level of play it should. Ah yes, with mid-terms come grades. As we have the past few seasons for games we attend, we evaluate the play of each facet of Miami’s lineup. FORWARDS: C. They didn’t score a single goal but the season is a process, especially with all of the rookies. There was a lot to like in the line combinations, especially the Sherwood-Bachman combination with Green on the right wing. Anthony Louis showed a lot of life on the first line with Josh Melnick, who never seems to have an off game, and Carson Meyer gives the former two a sniper to finish. Conor Lemirande really seemed to step his play up, as he carried the puck more and was effective in both ends of the ice, using his huge frame. DEFENSEMEN: B. The three freshmen did their jobs by not making a splash. Grant Hutton and Scott Dornbrock both looked like they may take another step forward this season, and Belpedio was at times the best and at other times the worst among this corps. Hopefully his first period was just the result of new captain jitters. GOALTENDING: A. Well, Larkin made a couple thousand new fans, especially since he made his overtime rebound-shot save in front of the most boisterous fans in the student section. It was just one game but the kid looks like the real deal: Watching him away from the puck he appears to have great anticipation of where the puck is going and is athletic enough to position himself perfectly in order to squelch any scoring threats. LINEUP CHANGES: How about this for Game 3: Blasi’s starting 19 were the same as in Game 2. One surprise was that goalie Chase Munroe was a scratch, and Andrew Masters was the backup. Masters was expected to be the third goalie after committing late last school year. 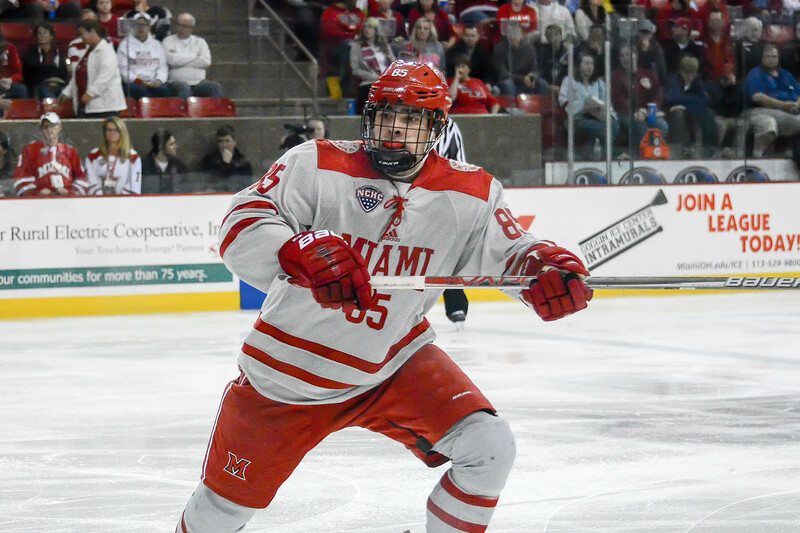 Miami is light up front, with Alex Alger and injured Christian Mohs being the only scratches there, and Colin Sullivan and Grant Frederic sat among the blueline corps. Posted on October 16, 2016, in 2016-17, analysis, Ohio State Buckeyes and tagged 2016-17 miami redhawks, analysis, karch bachman, Ohio State Buckeyes. Bookmark the permalink. Leave a comment.